Thieves disguised as employees of a recycling company recently walked into hospitals in Canada and walked out with barrels of old X-ray films. Similar thefts have been reported in Pennsylvania, Maryland, Delaware, and Massachusetts. The enterprising thieves were likely after the silver in the old films. Like gold and copper, silver’s value has been increasing. The latest figures put it at about $28 per troy ounce (about 31 g)—up from $17 in 2010. Given the sour economy, many people are looking anywhere they can to make some money. True, there isn’t much silver in X-rays. Even at the higher prices, 100 pounds of films would yield only about $35. It could be less if the films are newer. “As film technologies improved, manufacturers could put less and less silver in the film,” says Sharon Finney, corporate data security officer for Adventist Health System in Altamonte Springs, Florida. While stealing X-ray film for silver is interesting, thieves have fewer sites to target as radiography becomes a digital domain. 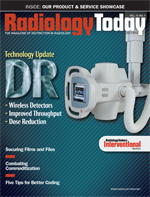 Theft of old X-ray films is only one example of radiology departments’ modern-day security concerns, whether in a hospital or a stand-alone facility. Whether it’s written on an X-ray or its cover or included in an EHR, radiology departments must protect patient information, says Mac McMillan, chairman and CEO of CynergisTek, a healthcare security consulting firm. The pressure on imaging facilities and departments to protect patient information has been on the rise ever since HIPAA was enacted in 1996. Add the rise of privacy regulations to rapidly changing technology and imaging departments have a lot on their plates, McMillan says. They must be concerned with both the use and destruction of images. McMillan suspects the number of thefts of old X-ray films could be on the rise because the value of silver is so high. “I’m guessing we’re seeing more incidents because of the value of silver. I’m not sure we’re seeing a lot more, but it’s just made it that much more lucrative to folks,” he says. “And as long as there’s something of value that someone can get their hands on, someone will try to figure out a way to do it.” Fortunately for imaging facilities and covered entities, extracting silver from X-ray films isn’t easy, McMillan says. The films must be heated to extremely high temperatures, and the yield won’t be particularly high. When facilities have X-rays they no longer need to keep, they can hire firms that will bring dumpsters to the site. Some will shred the films on site. Others will transport the films in locked bins to destruction sites so the security is high, McMillan says. Finney says Adventist Health System works closely with its vendors to be sure the images are viewable only for a reasonable amount of time. The radiologists have to log in and enter a password to be able to view the images, but the images won’t stay open forever. “If [a radiologist] lays his iPad that he’s been using to view images on the kitchen table and walks away, it will close within a short time,” she says. McMillan believes radiology departments and imaging facilities have become better at protecting data since HIPAA came into play. Industry studies show that about 60% of imaging facilities have adopted security detection programs. However, he says, many are still far too reactive and not proactive enough. “They have to be actively monitoring what everyone is doing, and less than 20% monitor their systems in an automated fashion,” he says.